Growing up Halloween was always my favorite holiday – the combination of scary movies, dressing up in costumes, trick-or-treating, and getting scared beyond belief in haunted houses all made it my favorite day of the year. I’ve been a grown up now for a couple years and the magic of holidays has mostly been forgotten. 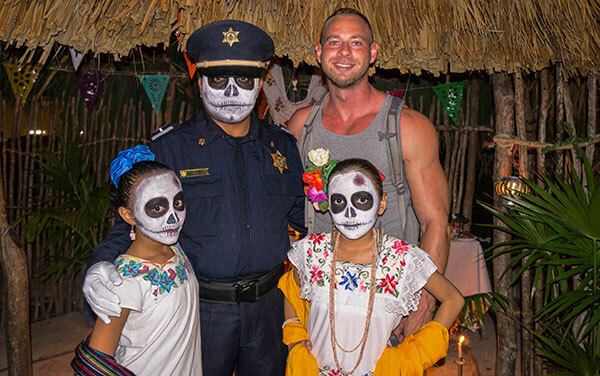 I didn’t originally plan for it, but after realizing I’d be in Mexico for Day of the Dead (Dia De Los Muertos in Spanish) I quickly became the most anticipated event of my trip. We don’t have this holiday in the U.S. and I couldn’t wait to see the traditions another culture had to share. 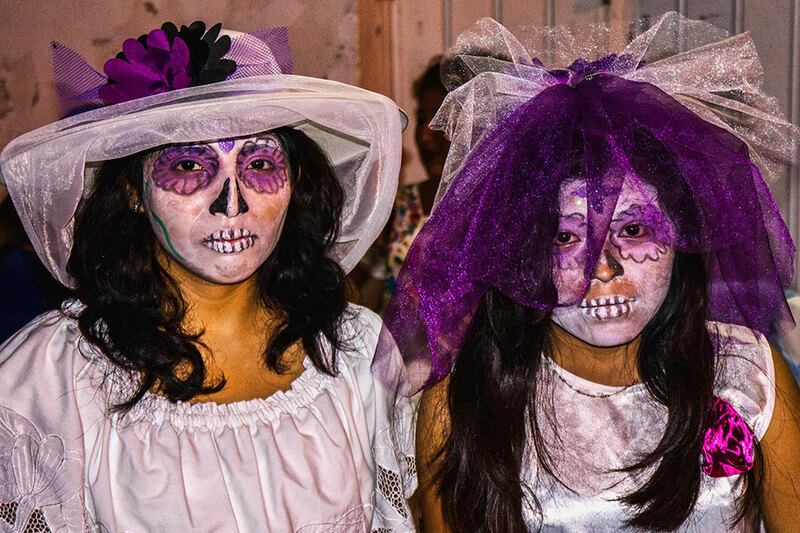 Unlike our holiday in the U.S. which has little meaning other than just to have fun and get a few scares, Mexicans take 3 days to remember, pray for, and honor their dead in unique and fascinating ways. 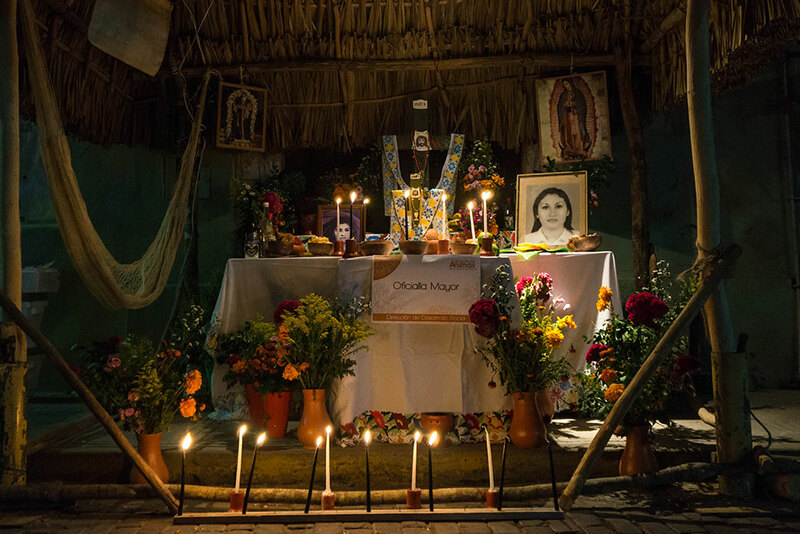 Traditions include building special altars to honor the deceased loved ones using photographs, favorite foods and possessions of the departed. 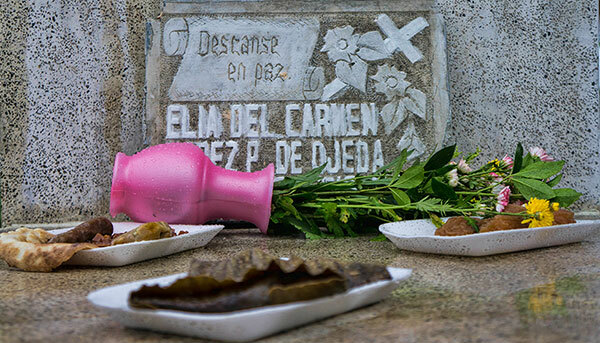 Family and friends also gather at cemeteries (cementerios in Spanish) to visit graves and leave offerings to their loved ones throughout the day and night. 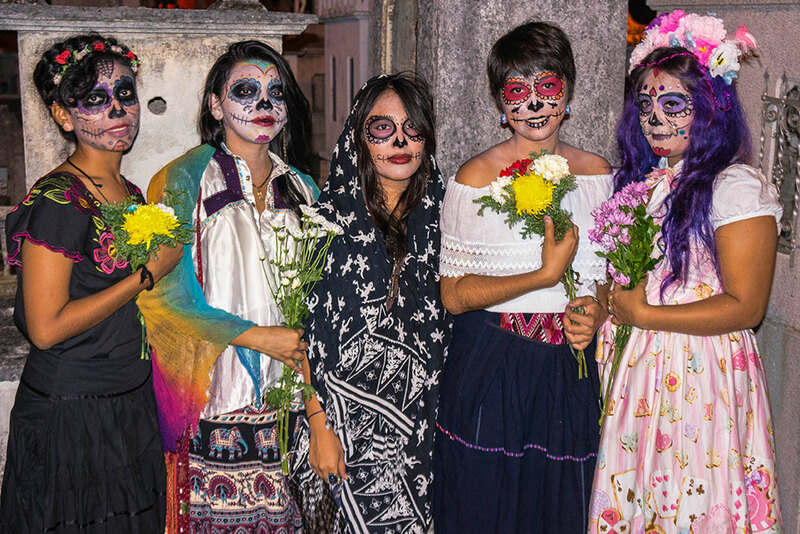 Day of the Dead is celebrated differently depending on the region of Mexico you happen to be in. I chose to make my first attendance of this holiday in the Yucatan, more specifically the city of Merida. There’s a large Mayan presence here and the people have their own name for these celebrations, Hanal Pixán which roughly translates to “food for the souls.” Like in other areas, shrines are built with photos and specially prepared food offerings to help deceased loved ones find their way home. A unique tradition to this area is cooking Pibipollo, a special tamale wrapped in banana leaves and cooked in an underground pit. 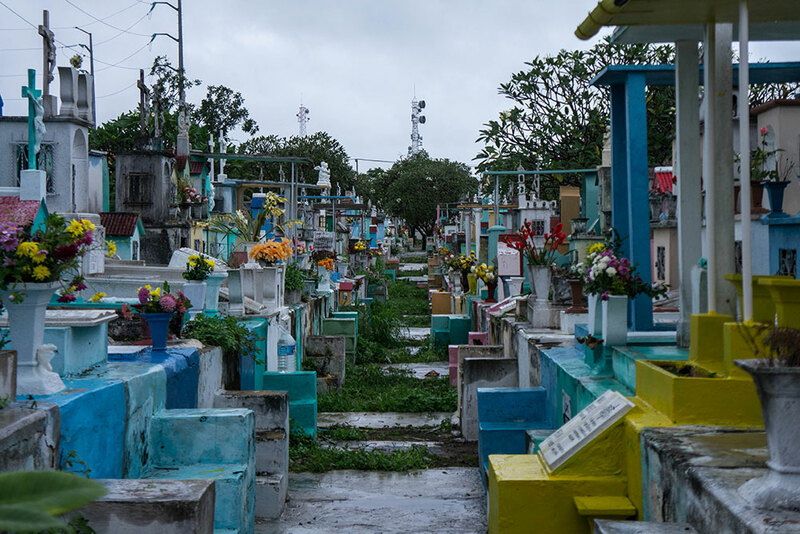 Upon arriving in Merida I had thought Oct. 31st was going to be a generally dull day and that most celebrating of this holiday would be happening on November 2nd, All Souls’ Day. 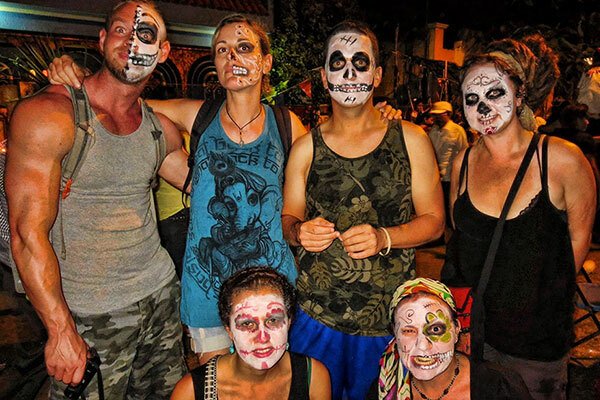 It ended up being the opposite and this was the day that tens of thousands flocked onto the streets to remember the dead, paint their faces, and have a wonderful time. I wasn’t sure what to expect, would the memory of your deceased and the construction of a large shrine cause you to be in a generally solemn mood? It didn’t appear so on this night, as most people seemed to be in good spirits and enjoying the ensuing crowd. 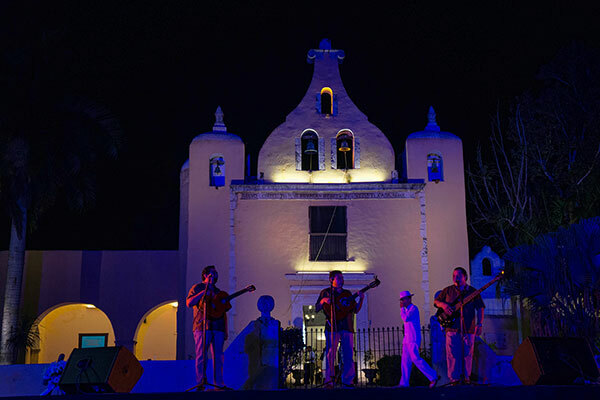 Next was the large attraction at the park, half way to the cemetery – faces were painted, official city cultural attractions were on display, and a live band was jamming out to an enthusiastic crowd. And yes, that’s a real police officer posing with me below! 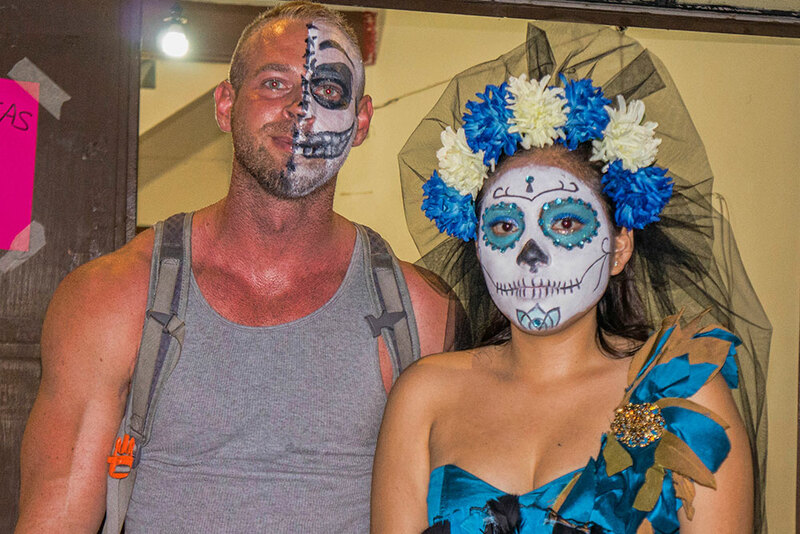 In the middle of all this joy and fun something happened that always amazed me – I ran into a girl I had met on a bus 2 weeks previously, leaving Costa Rica. 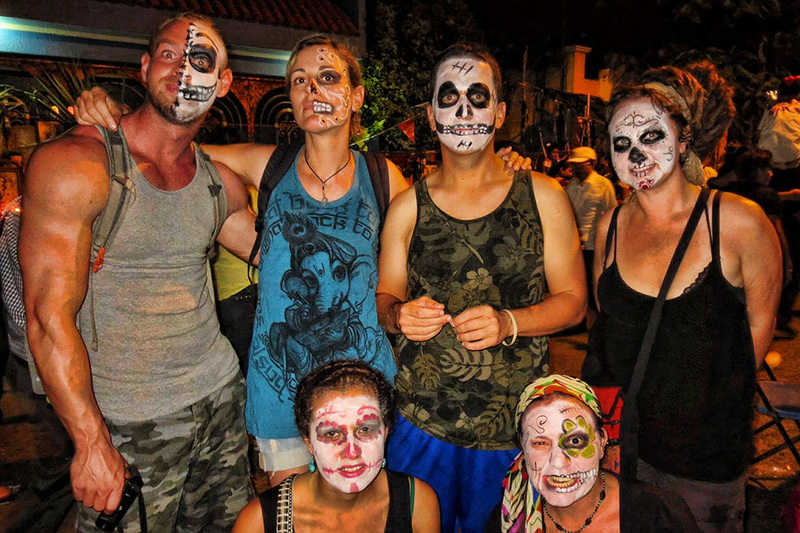 With her was a group of travelers from all over the globe and before I knew it my solo holiday had just become one I’d share with a new group of friends. 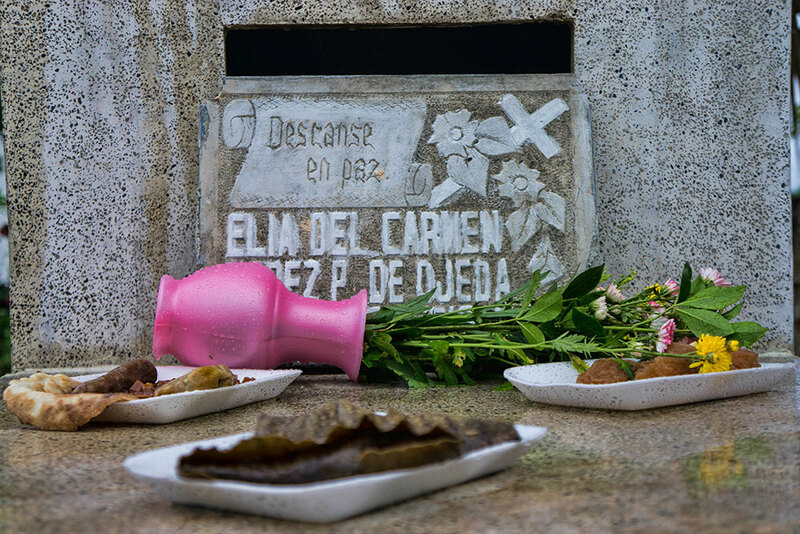 After passing dozens more altars and eating some delicious Mexican treats we all made our way down to the cemetery. 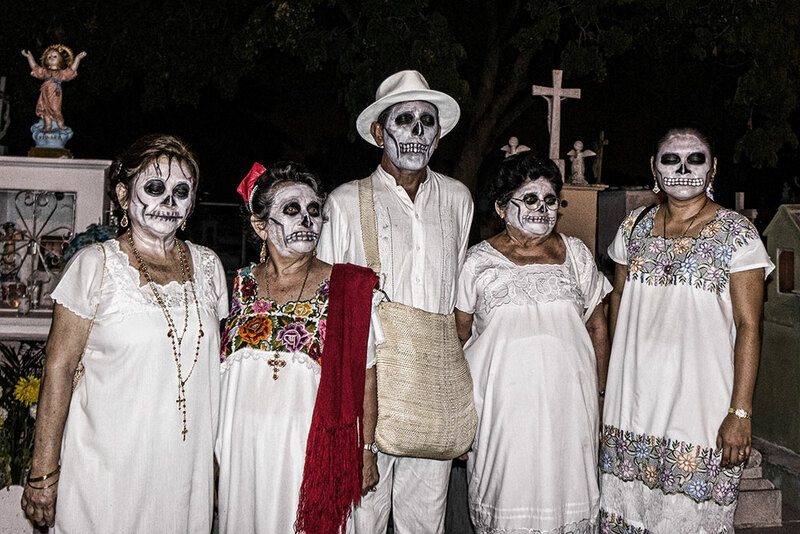 A guided tour ensued with the cemetery’s long history and graves being shown off. After dragging myself out of bed and feeling only slightly recovered from the previous night’s partying it was unclear what would be going on around the city. The rain and gloomy clouds didn’t do any favors either. Other than some small celebrations in the central park this day was mellow. That didn’t stop the new group of friends and I from once again exploring the city’s after dark attractions and having a good time. Once again, it was unclear what would take place on the final day, and there were no official city events going on. Determined not to let the rain ruin my parade I headed back to the cemetery. 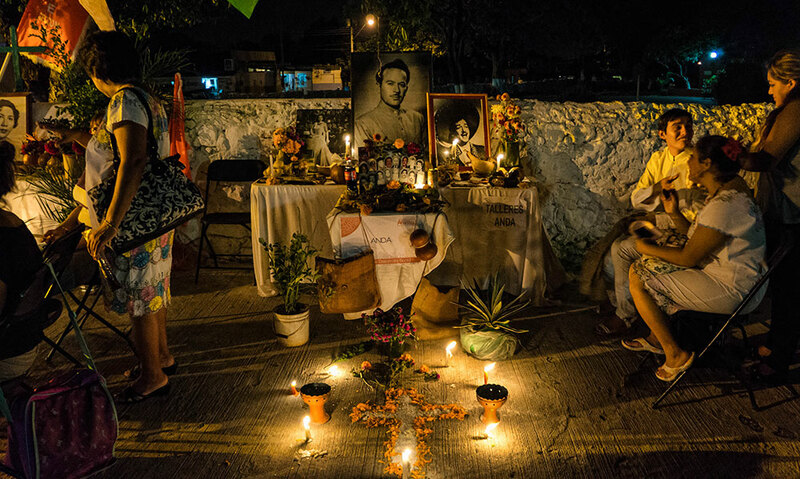 Graves were glowing with the flicker of flames from candles. 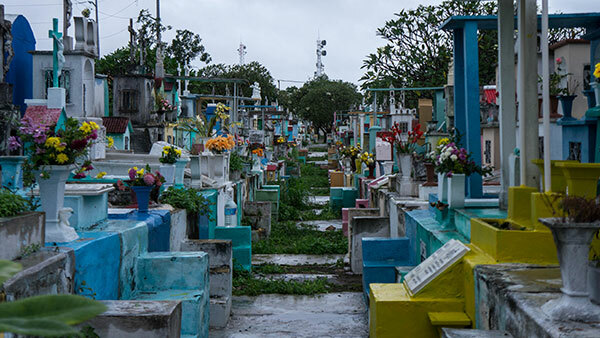 The usually somber and unwelcoming cemetery was now decorated with brightly colored flowers, freshly painted tombstones and just-cooked food. 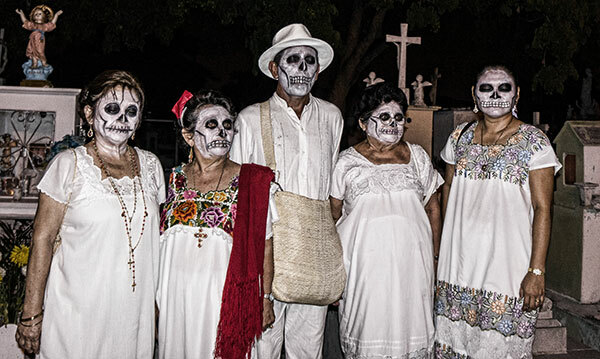 But there was no celebrating or costumes on this day – it was an intimate and personal time for families to gather and remember the dead in a serious way. I never felt unwelcome, but this was a time I found myself feeling a little out of place. 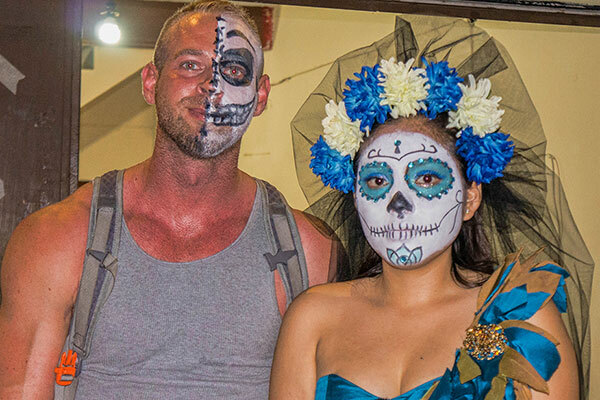 The night was spent partying until the early morning hours in an authentic Mexican cantina (an odd and amusing experience all of its own) and saying goodbye to all my new friends who had helped to make my first Dia de Los Muertos experience one I’ll never forget! Wow, people look awesome. I love all of the costumes!!! So scary!! Sounds like a fascinating time to be in Mexico! Love the make-up. The half and half face is particularly creepy! Crazy facepaint! It’s all a little bit scary haha. 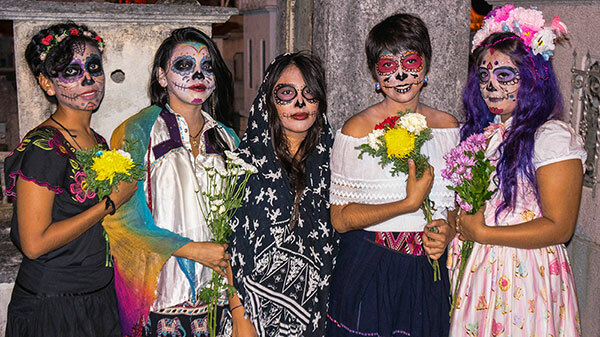 I would absolutely love to experience Day of the Dead in Mexico. I love local festivals and this is right at the top of my list. Great pics guys! Hello! I really love this blog post, thanks for sharing your experience. 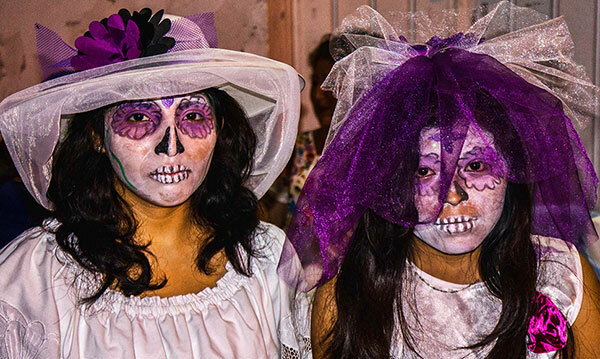 We’re going to Merida for Day of the dead. I’m a bit worried though that we can’t drive all the way in to our hotel, and don’t really fancy leaving the rental car somewhere else. Do you remember if the streets were closed during these days? The only street closed off from traffic was the one used for the celebration.. it wasn’t the main road in the city, nor was really in a tourist/hotel area, so you shouldn’t have much trouble with a rental vehicle. Was there any horror house or haunted house that you could walk in and get the living crap scared out of you? That would be like the perfect icing on the cake! I believe so, but I didn’t visit any. Well I guess we got to check that out today. Thanks for helping. Thanks for this post. 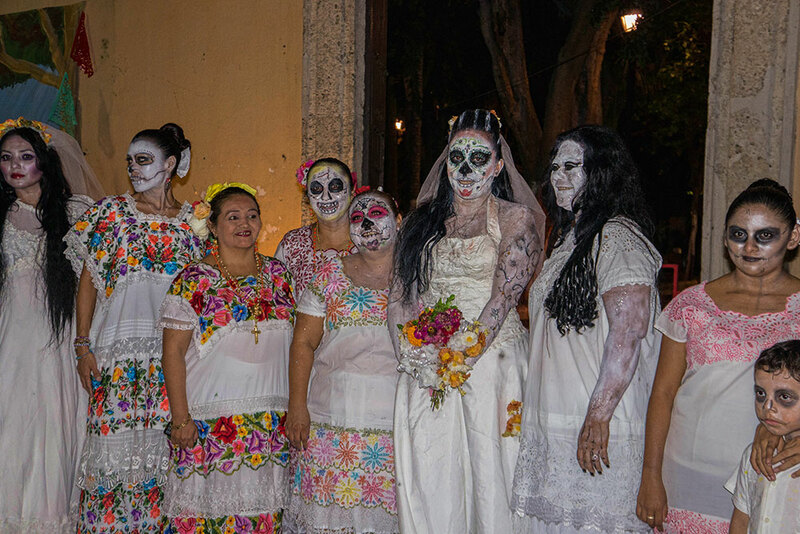 I’ll be in Merida for Dia de Los Muertos this year and am very excited to make this a part of my trip. 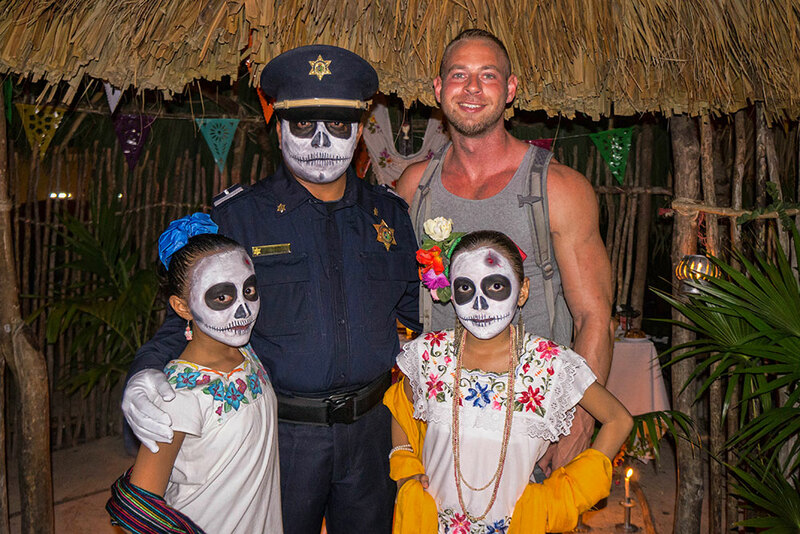 I did want to point out that while it is not widespread by any means in the States, here in Los Angeles it is celebrated across the city in a variety of festivities similar to what you described here. It’s a beautiful holiday and I highly encourage checking out LA’s version as well.